Go birdwatching with a Birding Pal from Dominican Republic. P Rodriguez Santo Domingo, Distrito Nacional Weekdays programmed in advance. Spanish and English. I started birdwatching because I was a fan of Annabelle Dod's articles and books, and when I got to know her personally I become totally involved with birdwatching and conservation. I've been birding for more than 30 years and know most hotspots of my country. We can help people arrange trips and/or connect with local guides that can offer some simple, easy birding in which one can easily pick up a dozen or more endemics and regional species. Or one can go for the more rigorous birding and try to get all 30 endemics and 20 regional specialty species. "Our Dominican Republic birding adventure was a huge success because of Birding Pal Steve Brauning. Prior to going, Steve forwarded advice on places to go and what to expect. We began our visit by meeting Steve at the botanical gardens in Santo Domingo where his skills were second to none! His advice was spot on for making this adventure memorable for us. Every destination needs a Steve Brauning. Thank you Steve. Birdwatcher, biology student, nature photographer, interested in bird conservation and ecology. Member of the Ornithological Society of the Hispaniola (SOH). The island of Hispaniola is home to 32 endemic species, found nowhere else in the world, most can be seen on the Dominican Republic. The island has the richest biodiversity and the highest endemism of the caribbean islands. Great birding can be enjoyed within a short drive form the city, but to really appreciate what the DR has to offer, plan for a 4 to 6 day stay on the island. 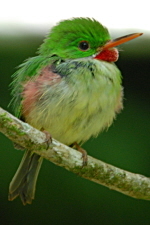 My are is a IBA and is one of the most important national park of this island Los Haitises National Park where you can find more than 100 spieces of birds. As part of the largest estuary in the insular Caribbean, the 208 km2 Los Haitises National Park is a protected area in the northeast of the country (see map), which offers the visitor a rich variety of natural wonders to explore, including: large expanses of mangrove, humid subtropical forest, sea grass beds, and pristine keys scattered along the length of the coast. The irregular topography of small, vegetation covered hills so characteristic of Los Haitises is the result of erosion subsequent to uplifting of the underlying limestone bedrock, formed over millions of years by marine organisms. The National Park of Los Haitises is Located at the western end of the bay on the south shore across from Sanchez, this park features mangrove swamps with giant mangrove trees forming a lush, green canopy above the watery trails that wind through the swamps. Taino caves where the islands first inhabitants lived are another popular attraction of the park. Tours leave from Samana, Sanchez and Sabana de la Mar at the park's eastern edge across the bay from Samana. Kate Wallace arrived in the Dominican Republic in 1994 to serve as a Peace Corps Volunteer in the area of Environmental Education. As a former teacher/naturalist with the Massachusetts Audubon Society, she quickly discovered the interesting variety of birds and soon joined a group of birders exploring the wild areas of the country. Part of her work was developing educational materials in parts of the country close to the national parks in the southwest and, in the process, she came to appreciate the opportunities available to visiting birdwatchers. After the end of her service with Peace Corps, she decided to stay in the country to continue working with groups involved with bird conservation. She began guiding in 1997 and has been active as a guide ever since. She is the local guide for Victor Emanuel, among others, and also will arrange tours to suit the time and interests of the birders.